Address: Deák F. u. 3-5. We await you with 37 double and 6 single rooms. Standard rooms are medium size and have showers. Superior rooms are large with mostly bathtubs. Our air-conditioned rooms feature cable tv, minibar, safe, hairdryer and broadband internet access. LAN cables are available at the reception desk. We provide bathrobes free of charge. Wellness facilities include a finnish- and infra sauna and a spectacular indoor pool and jacuzzi. We also offer various massages, hydrotherapy (aroma- and contrast bath) and a salt cabin. Dining includes the impressive conservatory of the Villa Pelikán Restaurant, and the gallery overlooking the bar. Our restaurant provides local and international specialities and a comprehensive range of wines, spirits and attentive, professional service. Flexible conference and meeting facilities, conveniently located on the basement level, are perfect for any occasion from a conference of eighty participants to smaller private gatherings and corporate events. 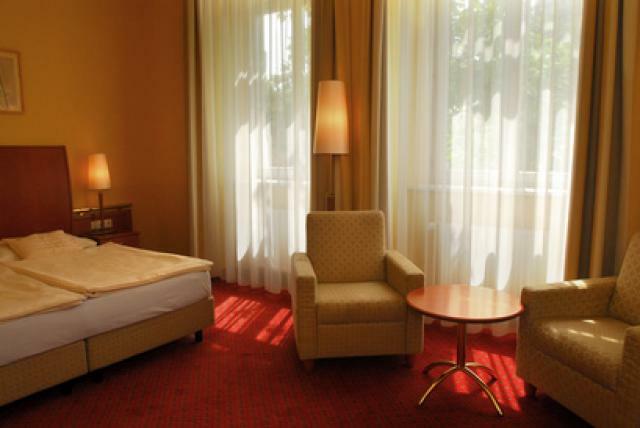 The rooms have natural light, carpeted floor and wireless LAN internat access. The room divides into three sections with their own cable and internet access allowing for breakout sessions.